The “tight turns” at Pimlico have been so thoroughly debunked by now that the horse racing world can agree that the only Tight Turn we ever saw at Pimlico was the Delaware-bred gelding by that name who raced on the Mid-Atlantic circuit back in the 1950s, and posted at least one recorded work over the course. There are decades worth of articles debunking the idea of Pimlico’s turns being so tight (1988, 2002, 2015, to cite just a few), but I wondered where that trope came from in the first place. I have yet to unearth enough information to say something conclusive about the origin of the term, though a few whispers of origin story suggest it might trace back to the second half of the 1950s. A 1997 book, “Crown Jewels of Thoroughbred Racing” by Richard Stone Reeves, dates it to Chick Lang’s jockey agent days, attributing to Lang a claim that Fabius, a horse his jockey Bill Hartack was riding, would benefit from the tight turns. Alternately, a 2002 Baltimore Sun article claims that Eddie Arcaro called the turns “tight” in 1957, though later regretted the wording as an inaccurate way of saying the track was narrower through the turns. Alas, without better sources of track scuttlebutt or jockey agent bluster, conclusively tracing the origin of the “tight turns” trope may be an exercise in futility. But, one thing is for sure: the 1970s were the heyday of colourful references to Pimlico’s most enduring myth. Pimlico has too many tight turns and it has a short stretch. We won’t run him there, but we will point him for the Belmont. I guess zero was too many. Naturally, once you win the Derby there’s all sorts of pressure to get you to the Preakness. But I’d have to do lots of soul-searching before I’d agree to commit Flag Officer to the Preakness. Flag Officer would have less chance in the Preakness than the other two Triple Crown events. It’s only a mile and 3-16s, and with those tight turns and short stretch at Pimlico our colt might be victimized by some cheap speed. Anyhow, if you win the Kentucky Derby, you’ve really done the job. We never got the chance to test the veracity of Schmidt’s claim that he’d bypass a Triple Crown bid. Flag Officer, the longest shot on the board at 46/1, finished 10th behind Seattle Slew in the 1977 Kentucky Derby. Of course, the malarkey about tight turns at Pimlico failed to dissuade Team Slew, and he went on to win the Triple Crown. The Elocutionist triumph was more impressive by the way the colt moved outside to grab the lead. Cashman, Lively, and trainer Paul Adwell figured the top contenders might drift wide on Pimlico’s tight turns and give Elocutionist the opportunity to shoot through on the rail. Despite the fact that the turns at Pimlico are not significantly tighter than at other major racetracks, the “tight turns” descriptor continues to be bandied about. The best we can do is keep an eye out for its most fun appearances — and keep our fingers crossed that maybe, just maybe, Tight Turn was named because someone was already sick of the repetition over sixty years ago. It seems you can’t open Twitter, Facebook, or a Daily Racing Form nowadays without seeing references to the Curse of Apollo, since two of the marquee Derby contenders, Justify and Magnum Moon, did not race at age two. As most of us who follow the sport closely know, it has been a long time since horse untested as a juvenile won the Derby. Apollo did it in 1882, but no one has done it since. It has now been 136 years since an unraced 2-year-old went on to win the Derby. There has been no shortage of analysis of whether it matters from a handicapping perspective that a Derby horse hasn’t run at two. But, we’re interested in language here: how long have people actually been talking about a Curse of Apollo in the context of the Kentucky Derby? It’s a concept the excellent racing history blog Colin’s Ghost skirted in 2012, the year of Bodemeister’s attempt to buck the trend. Its author, Kevin Martin, found nothing older than 1982 invoking the name Apollo in the context of a Kentucky Derby horse who did not race at two. That year the Derby favorite, Air Forbes Won, did not debut until March of his 3-year-old year. He entered the Derby undefeated in four starts, but crossed the wire in Louisville almost 10 lengths adrift of winner Gato Del Sol. That was the earliest link between a specific unraced 2-year-old in the Kentucky Derby and Apollo that I could find, too. But I found the underlying idea predates that, and the phrasing “Curse of Apollo” came far more recently. Though the column did not invoke the Curse of Apollo in so many words, it did point out that only Day Star and Apollo had won the Derby without a start at two. The comment about Day Star is inaccurate. According to both the Kentucky Derby’s official published profile of Day Star as well as an 1883 book by S. D. Bruce entitled “The Horse-Breeder’s Guide and Hand Book,” Day Star did race at two, including a second-place finish behind Blue Eyes in a one-mile race called the Sanford Stakes (in Louisville, not the one we know today at Saratoga). Beyond these more deliberate explorations of Derby prospects not racing at two, writers and pundits who cared to even mention that a Derby prospect didn’t race at two were few and far between. It earned a bit of mention in 1948 when a future Hall of Fame inductee entered the Derby without a race at two. Even then, that bit of his history never formed the focus. But, beyond Coaltown? People cared even less. Bert G., a Canadian longshot in 1945, was called “lightly raced,” but nothing more specific. It didn’t come up in either a preview nor dozens of “person-on-the-street” picks when discussing Fanfare in 1951, even though Fanfare was a Pensive half-brother to Coaltown. A UPI syndicated article in 1974 not only failed to mention that Agitate never ran at two, but proclaimed that Agitate had “the best record among the 23 horses entered” in the Derby — something no one would say nowadays about any Derby horse who only raced at three. They then went on to discussing other entrants. However, people in 1982 were a lot like people in 2017. Fifteen paragraphs before this discussion of Air Forbes Won’s lack of juvenile races came a mention that another Derby horse, Cassaleria, had just one eye. Air Forbes Won seemed a bit of a Coaltown case, though: he was discussed in more detail in print because he was second on the morning line, and even went off the chalk. In a time when column inches were rationed, he deserved more space. From 1983 through 2003, 17 horses unraced at two ran in the Derby. None went off favored. Only four such horses went off at single-digit odds in their own right, and not part of coupled entries or the mutuel field: Corporate Report (8/1 in 1991), Strodes Creek (7/1 in 1994), Pulpit (5/1 in 1997), and Atswhatimtalknbout (8/1 in 2003). An Associated Press piece about Atswhatimtalknbout did mention that he did not race at two, but did not reference Apollo, and mentioned the lack of a juvenile race record in the same breath as the fact that Steven Spielberg owned a piece of the horse. The next year, Sports Illustrated mentioned in an online photo gallery that Showing Up had not raced at two, but balanced that out with references to his impressive victory in the Lexington, and the top class of his connections. Yet, even though Showing Up entered the Derby undefeated, comparably few words that Derby season were spent on the 26/1 shot — after all, Lael Stables also owned Barbaro. Apollo references gained steam in 2009, mainly in the context of eventual 5/1 shot Dunkirk, although it was 43/1 Summer Bird who ended up performing better, between the two contenders unraced at two. References to the 1882 Derby winner began to permeate the blogosphere. Robert Lee, blogging for the Albany Times-Union, dismissed the trend against unraced 2-year-olds (without naming Apollo specifically) and picked Dunkirk. “Jim the Tolerable,” at Full of Run, proclaimed “the one rule we keep hearing over and over is that no horse has won the Derby with zero starts as a 2-year-old since Apollo in 1882” — before spending most of his post discussing how no horse with a stupid name had won the Derby since Hoop Jr. in 1945. Pace Advantage posters, as they had since the days of Greeley’s Galaxy, trotted out the Apollo statistic. The year of Dunkirk also brought the first occurrence — or, given the vagaries of private email lists, forums, and web page deletion, the earliest remaining publicly discoverable occurrence — of the phrase “Apollo curse” in the context of horse racing and not Greek mythology. In his blog Enthusiast of All, Matt Elliott refers to both the “Apollo jinx” and the “Apollo curse” when discussing the pros and cons of Dunkirk. He acknowledges it as a historical trend, but doesn’t give it make-or-break status; he picked Dunkirk. The comment came in a preview of the San Felipe Stakes. The two horses about whom Hovdey was writing, Albergatti and Runflatout, both failed to make the Derby field. Still, Santa Anita Derby (G1) winner Midnight Interlude ensured that Apollo would get some ink closer to the 2011 Kentucky Derby. Matt Elliott once again referred to “the dreaded Apollo curse” when assessing Midnight Interlude’s Derby chances. The first horse racing related reference to the Curse of Apollo on Twitter surfaced three days before the 2011 Derby, when @chasingthederby made notes on Midnight Interlude’s chances. Discussion of the lack of Derby wins by unraced 2-year-olds has flowed strongest when a horse fitting that profile is a Derby favorite. That happened on the scale of print media in 1982 with Air Forbes Won — and it happened on Internet scale in 2012, the year Bodemeister went off the chalk in the Kentucky Derby. Other phrasings were used that year, too. Steven Crist of the Daily Racing Form referred to a Derby winner having run at two as “the grandaddy of Derby rules,” a passage that the Kentucky Derby media guide still quotes. Jeff Siegel, then of HRTV, publicized a segment about the Apollo jinx. But 2012 was when the “curse” phrasing went from sporadic reference to ubiquitous maxim. 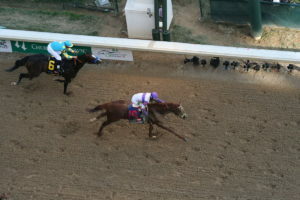 Once Bodemeister crossed the wire in the 2012 Arkansas Derby, it gained steam. Both @TalkRacingToMe and @stevejPS referenced the Curse on April 14, the day of the race. @Evildoer_Esq mentioned it the next day. The blog post is undated, but based on its content it was written after the Arkansas Derby, and it was linked on Twitter as early as April 16. From there, it picked up some Twitter traction. Even Ahmed Zayat, Bodemeister’s owner, mentioned it there. It also appeared in the blogosphere with more frequency than in previous years: an April 20 look at statistics related to unraced 2-year-olds in the Derby on Ahead By Three, a reader letter to the DRF blog that was published on April 27, and, of course, on early adopter Matt Elliott’s Kentucky Derby preview on May 4. The Curse of Apollo got its first few mentions on public posts on Facebook in 2012, as well: a post on the Kentucky Derby Digest page on April 30, as well as a mention on The Giddyap Girls page on May 7, just after the race was over. The “Curse” terminology had stuck, and since then, it has become almost a stock phrase when discussing the Derby chances of horses who didn’t race at two. Does the Curse of Apollo matter in a handicapping sense? Handicappers will argue that until the Kentucky Derby — and for at least another year, as long as neither Justify nor Magnum Moon wins on Saturday. But now you know the history of the term, and how it’s a social media-friendly packaging for an idea that has been bobbing in and out of the Derby picture for decades.